2 Technische Universität Dresden, Institut für Botanik, Plant Phylogenetics and Phylogenomics Group, D-01062 Dresden, Germany. Peperomia subgenus Tildenia is a poorly known group of geophytic species occurring in seasonal habitats in 2 biodiversity hot spots (Mexico-Guatemala and Peru-Bolivia) with few species reported from the countries in between. Recent fieldwork combined with detailed study of herbarium specimens of this subgenus in Mexico and Central America resulted in the discovery of 12 new species, which are here described and illustrated. In addition, 1 formerly published variety is raised to species rank. Distribution, habitat and phenology data and detailed comparisons with other species are included, as well as an identification key for all species belonging to this subgenus in the studied area. Key words: tuber, terrestrial, endemism, Tildenia. Peperomia subgénero Tildenia es un grupo poco conocido de especies geofíticas de hábitats estacionales en 2 hotspots de biodiversidad (México-Guatemala y Perú-Bolivia) con pocas especies en los países de enmedio. El trabajo de campo realizado recientemente en México y América Central, combinado con un estudio detallado de ejemplares de herbario de este subgénero, resultó en el descubrimiento de 12 especies nuevas, que se describen e ilustran. Además, una variedad anteriormente publicada es elevada a la categoría de especie. Se incluyen datos de distribución, hábitat y fenología, comparaciones detalladas con otras especies, así como una clave de identificación para todas las especies del subgénero en la región estudiada. Palabras clave: tubérculo, terrestre, endemismo, Tildenia. The genus Peperomia Ruiz et Pav. includes approximately 1600 species (Samain et al., 2009), and is one of the 10 most species-rich genera of angiosperms (Frodin, 2004). The largest diversity of the genus is encountered in America where it occurs in a wide range of habitats from southern USA to northern Argentina and Chile. Although it is generally thought that the majority of Peperomia species are epiphytic, an important but currently not yet adequately estimated number are terrestrial. Perhaps as a consequence of this generally accepted idea that most Peperomia species are epiphytes, the terrestrial species are undercollected and have been studied less intensively. Peperomia subgenus Tildenia (Miq.) Miq. is a poorly known group of geophytic species. Our knowledge of these species is even more restricted than other terrestrial species of Peperomia as the geophytes are only above-ground during a few months of the year, usually the local rainy season. This reduces the chance of being collected unless one is specifically looking for them. The group is easily recognizable because of the presence of a tuber with petioles and peduncles originating directly from it (Wanke et al., 2006; Samain et al., 2009). Most species occur in seasonal habitats in 2 biodiversity hot spots (Peru-Bolivia and Mexico-Guatemala) with few species reported from the countries in between. The last detailed study dealing exclusively with subgenus Tildenia dates back more than a century (Hill, 1907). A comprehensive reinvestigation of this group has largely been hindered by fragmentary and insufficiently documented herbarium material. Many specimens lack tubers and/or inflorescences, which are essential for proper identification. Furthermore, key information (e.g. color, texture) often got lost during the drying and storage process and habitat data are usually missing. Finally, the similar habit of most species of subgenus Tildenia hinders their identification. Observation of living plants in their habitat combined with meticulous reinvestigation of existing herbarium material is a prerequisite for correct identification. During this study it became obvious that subgenus Tildenia in this area includes many more species than initially assumed. In this study 12 species are newly described and 1 former variety is raised to species rank. Collections of these newly described species can be ranked in 3 categories: 1) collections which already had been recognized as belonging to new species by other botanists but which remained undescribed, 2) collections representing these new species that had been incorrectly identified, often as a widespread species, despite the fact that the specimen did not at all fit to the description of this common species, 3) collections we made at localities where to our knowledge nobody had ever collected a tuberous species of Peperomia before, proving that this group is generally overlooked. A key to all species of Peperomia subgenus Tildenia we currently recognize in Mexico and Central America is presented in expectation of a future revision of the entire subgenus Tildenia. Field work, dedicated nearly exclusively to this group, was recently carried out in close collaboration with local botanists in Mexico and Costa Rica. This study is based on the analyses of about 100 of our own recent collections and approximately 600 additional specimens from 57 herbaria. For our own collections, specimens of different developmental stages as well as longitudinal sections of the tubers were preserved. When possible, infructescences with mature fruits were stored in 70% alcohol. After careful cleaning and digital imaging of all aerial and subterranean parts, plants were immediately pressed and dried using a hot air drier that kept the temperature of the specimens below 50°C. Type: MEXICO. Michoacán: mun. Aquila, just beyond Puente Aquila, along the road to the Pacific Coast, 18°35'05.3"N, 103°30'55.4"W, 180 m, 25 Jul. 2007, M.-S. Samain et al. 2007-046 (holotype: BR! ; isotypes: G!, GENT!, K!, MEXU!, MO!). A Peperomia schizandra Trel. differt laminis atrovirentibus albonervosis supra reticulatis. Small herb, ca. 5 cm tall in vegetative stage, entirely glabrous. Tuber globose, slightly flattened, to 8 mm diameter, the surface smooth, yellow, rooting at apex. Leaves 1-5(-20) per plant; petiole (3-)5-7(-12) cm long; lamina membranous, irregularly orbicular, to 7.5 cm diameter, peltate centrally or a little below center, the apex rounded or discretely obtuse, rarely acute, 8-palmatinerved with 3 nerves running into apical half of lamina, 2 nerves running almost laterally and 3 nerves running into basal half, the main nerves distally branching, the nerves and a small zone along nerves white or creamy adaxially, distinctly contrasting with deep green color of remainder of the lamina, green or purple between nerves abaxially, adaxially reticulate. Spadices 1-5 per plant; peduncles 5-7(-10) cm x 1.5 mm; rachis 2‑5(‑10) cm x 2 mm, usually distinctly shorter than peduncle, tapering at apex, white or whitish green, the distal 1 cm purple, or entire rachis pink-purplish, loosely flowered. Floral bracts elliptic, 0.8 x 0.6 mm, centrally peltate, the apex acuminate, the margin slightly undulate. Stamens with filaments 0.4 mm long when fresh; anthers 0.45 x 0.35 mm, pink purplish before releasing pollen, later shriveled and brown. Ovary ellipsoid, initially smaller than style and entirely covered by floral bract; stigma terminal, subglobose, fimbriate. Fruits ellipsoid, the body 1-1.5 x 0.7-1 mm, centrally attached at base, on short and broad pseudopedicel when mature; pericarp verruculose when fresh, reticulate when dried, dark brown; style mammiform and minutely verruculose when fresh, conical and rather granulose when dried, 0.2-0.3 mm long, dark brown. Additional specimens examined. MEXICO. Guerrero: distr. Mina, Placeres, under trees, 350 m, 24 Jul 1936, G. B. Hinton 9145 (GH!, ILL!, K!, MO!, NY!, US!). Jalisco: 13 miles N of Santiago (Colima), Río Cihuatlán, 175-200 m. 31 Jul. 1957, R. McVaugh 15939 (MICH! ); mun. Pihuamo, along highway 110, E of Huizache, 19°10'23.3"N, 103°28'50.9"W, 660 m, 21 Jul 2007, M.-S. Samain et al. 2007-039 (BR! GENT!, MEXU!). México: mun. Temascaltepec, Bejucos, 610 m, 4 Jul. 1933, G. B. Hinton 4279 (ILL!, K!, NY!). Etymology. The specific epithet refers to the white to creamy adaxial nervation pattern of the leaves, a distinct feature of this species. Distribution and habitat. Peperomia albonervosa is reported from tropical deciduous forest (bosque tropical caducifolio and subcaducifolio sensu Rzedowski, 2006) in Jalisco, Guerrero and México. It occurs at lower elevations (175-660 m) in shallow soil in crevices in rock formations. Peperomia schizandra grows in a similar habitat and vegetation type, but at slightly higher average elevation (the highest locality is at 1100 m) and with a broader distribution as it also occurs in Colima, Michoacán and Oaxaca, and northwards up to Nayarit. Phenology. The plant has been found above-ground in July, flowering and fruiting. This species is morphologically similar to P.schizandra Trel. from which it differs by the dark green, white nerved and adaxially reticulate lamina. Although these characters are obvious in living plants (Fig. 2), they tend to fade in herbarium specimens, and many collections are often misidentified as P. schizandra. Basionym: Peperomia macrandra C.DC. var. ampla Trel., Botanical Gazette 73: 140. 1922. Type: MEXICO. Morelos: canyon above Cuernavaca, 6500 ft [1980 m], 21 Jul 1904, C. Pringle 13282 (holotype: US! ; isotypes: BH!, F!, GH !, MICH !, US !). Robust herb, up to 25 cm tall in vegetative stage, entirely glabrous. Tuber irregular, rooting at the apex, rhizomatous up to 5 cm or more diam., sometimes lobed and with leaves and inflorescences originating from 1-3 growing points. Leaves 2-5 per plant; petiole up to 25 x 0.5 cm; lamina chartaceous, orbicular or slightly ovate, up to 10 cm diam., centrally peltate or rarely a little below center, the apex acute to acuminate, 8-(9)-10-palmatinerved, the main nerves branching, reticulately nerved in between, a peripheral anastomosing nerve running along entire margin. Spadices 1-4 per plant; peduncle up to 8 x 0.5 cm, distinctly shorter than the petiole; rachis up to 40 x 0.6 cm, loosely flowered. Floral bracts orbicular to elliptic, 0.9 x 0.6 mm, centrally peltate, the apex acuminate, the margin slightly undulate, minutely hyaline glandular-dotted. Stamens with filaments short and thick when young, longer and slender when maturing, finally wilted but still present, 0.3-0.9 mm long; anthers 0.2 x 0.3 mm. Ovary smaller than its prominent, ovoid, glandular-dotted style, resulting in a typically mushroom-shaped pistil; stigma fimbriate, terminal on a small, slightly abaxially inclined, stigmatal plateau. Fruits ellipsoid, body 0.8-0.9 x 0.7 mm, sessile, centrally attached at base; pericarp granulose, basally papillate; style conical, 0.3-0.4 mm long. Additional specimens examined. MEXICO. México: 'Barranca de Tonatico', 1420 m, 26 Sep. 1954, E.Matuda et al. 31682 (MEXU!). Morelos: mun. Cuernavaca, Sierra de Morelos, mixed forest in canyon, 1975 m, 2 Aug. 1969, G. Hinton et al. 17229 (MICH! ); Valle del Tepeite, Huitzilac, Aug. 1930, E. Lyonnet 667a (ILL!, MEXU !, US! ), Valle del Tepeite, Sierra de Ocuila, Sep. 1930, E. Lyonnet 667b (NY! ); Valle del Tepeite, Huitzilac, Jul. 1933, E. Lyonnet 667c (MEXU ! ); Santa María, 10 Aug. 1933, E. Lyonnet 667d (MEXU ! ); Valle del Tepeite, Sep. 1933, E. Lyonnet 667e (GH!, K!, MEXU !, MO!) [based on the several collection dates and localities, Lyonnet 667 includes 5 different gatherings, which have been annotated by us chronologically a-e]. Distribution and habitat. Peperomia ampla is known from tropical deciduous forest and pine-oak forest in the states of México and Morelos, at approximately 1400-2000 m elevation. Phenology. The plant has been found above-ground from July to September, flowering and fruiting. Trelease (1922: 140) mentioned the diagnostic characters of variety ampla by 1 sentence: "A large form with round-ovate leaves as much as 8 x 10 cm and shorter beak on the fruit". He apparently had only seen the US specimen, which he designated as the holotype. Close inspection of the isotypes reveals that there is more morphological difference between the variety and the species than between some other geophytic taxa. This is also confirmed by the other collections mentioned above and therefore, variety ampla is raised here to species rank and an emended description is provided. From P. ampla, P. macrandra C.DC. 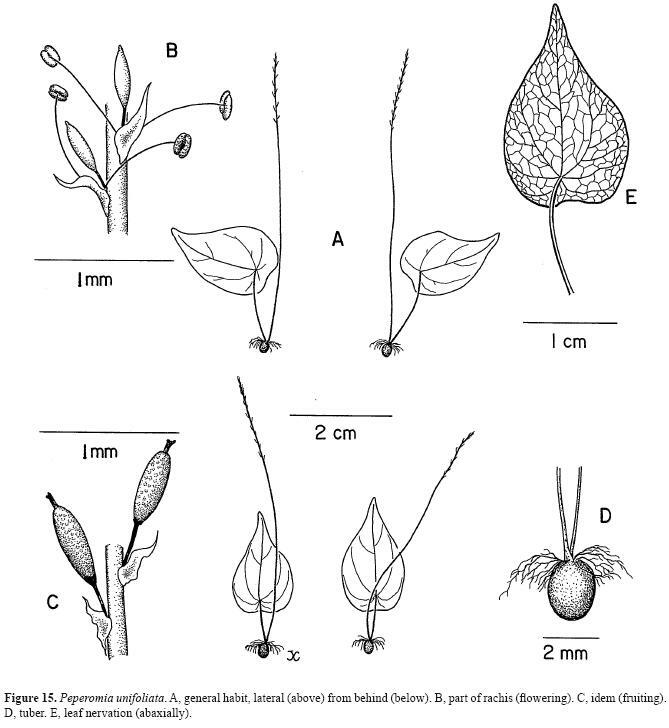 differs in its more slender general habit, in its leaves (ovate, 4-6 x 2.5-4 cm, peltate at about ¼ of the leaf length from the base, apex usually longer acuminate), spadices (peduncle distinctly longer than rachis) and fruits (ellipsoid-cylindrical, pedicellate, pericarp not papillate, style cylindrical). Both are obviously not identical as has been suggested by Nyffeler and Rowley (2002: 366). In its vegetative stage P.ampla rather resembles P.cavispicata G. Mathieu. Nevertheless, the latter is distinct in its fusiform rachis and more slender petiole. The robust rachis in P. ampla is longer, has about the same diameter over its entire length and is supported by a thick peduncle. Although both species exhibit pistils with a prominent style, their shape is broadly ellipsoid to ovoid in P. ampla (Fig. 3) whereas it is narrowly ellipsoid to cylindrical in P.cavispicata. Peperomia ampla has a large, irregular, rhizomatous tuber whereas it is rather small and globose in P.cavispicata. Type: MEXICO. México: Nevado de Toluca, N slope of the volcano, just E of where the road crosses the timberline, 19°07'29.2"N, 99°45'38.6"W, 3920 m, 18 Jul. 2007, M.-S. Samain et al. 2007-036 (holotype: BR! ; isotypes: GENT!, MEXU!). A Peperomia gracillima A. W. Hill differt tubere, e base radicanti, parte basali laevi flavaque, parte apicali aspera brunneaque, bracteis floralibus antheribusque majoribus, filamentis bis brevioribus. Delicate herb, 2-5 cm tall in vegetative stage, entirely glabrous. Tuber globose when young, yellow, smooth, to 8 mm diam., older tuber same diameter but to 1.5 cm tall, sometimes apically lobed, the basal part yellow and smooth, the apical part rough and brown, rooting at base. Leaves 1‑10 per plant; petiole to 3-4 cm in exposed locations, delicately elongated to 7 cm when growing in mosses; lamina orbicular, 0.6-1.6(-2) cm diam, centrally peltate, the apex rounded or obtuse with acute or acuminate tip. Spadices 1-15 per plant; peduncle (3‑)4-5(-10) cm; rachis 2-7 cm, usually same length or longer and slightly thicker than the peduncle, loosely flowered. Floral bracts elliptic, 0.8-0.9 x 0.6 mm long, centrally peltate, the apex acute or acuminate. Stamens with filaments 0.3 mm long; anthers 0.2 mm long. Ovary ellipsoid; stigma terminal on small and slightly oblique stigmatal plateau. Fruits ellipsoid, 0.8-0.9 x 0.6 mm, sessile to subsessile on pseudopedicel less than 0.3 mm long; pericarp granulose; style short-conical, 0.2 mm long. Etymology. 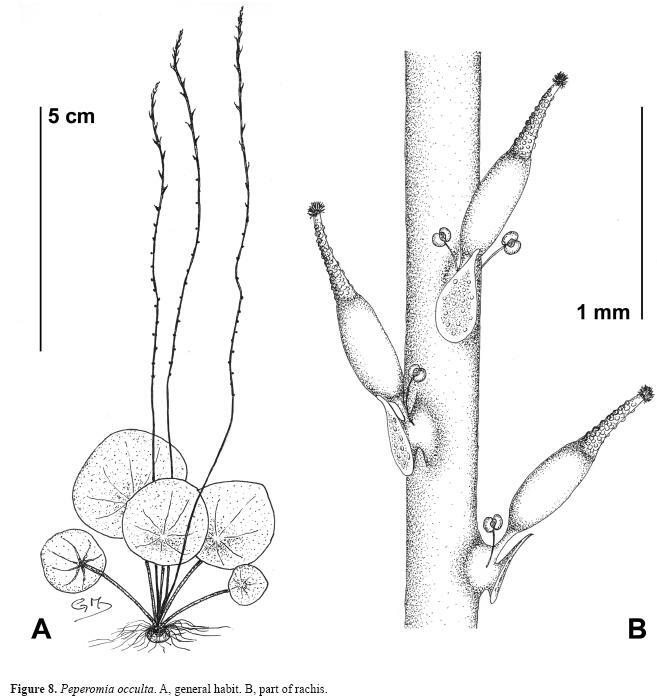 The specific epithet refers to the position of the roots at the base of the tuber, which is atypical among the Mexican geophytic Peperomia species, in which the roots generally originate at the apex of the tuber. Distribution and habitat. 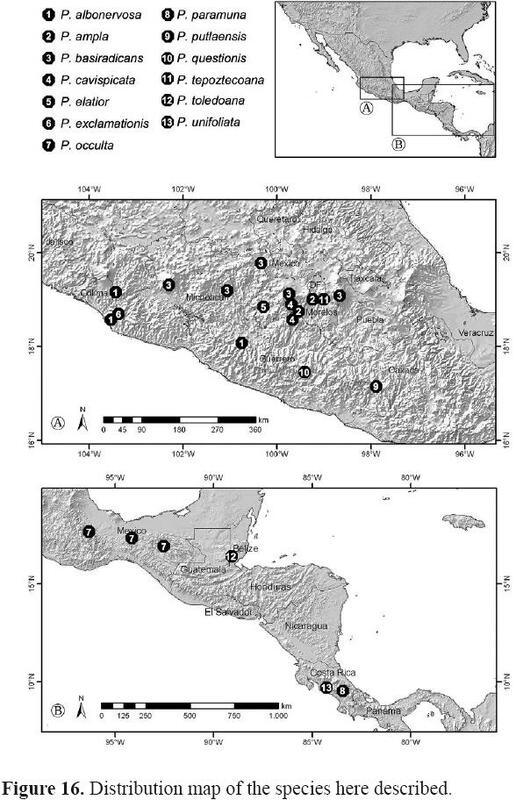 Known collections are from the Trans-Mexican Volcanic Belt in the states of México and Michoacán where the species appears to occur on volcano slopes at 3000-4000 m in rather moist rocky habitats, near the upper limit of pine forest or above the timberline. Phenology. The plant has been found above-ground in July and August, flowering and fruiting. 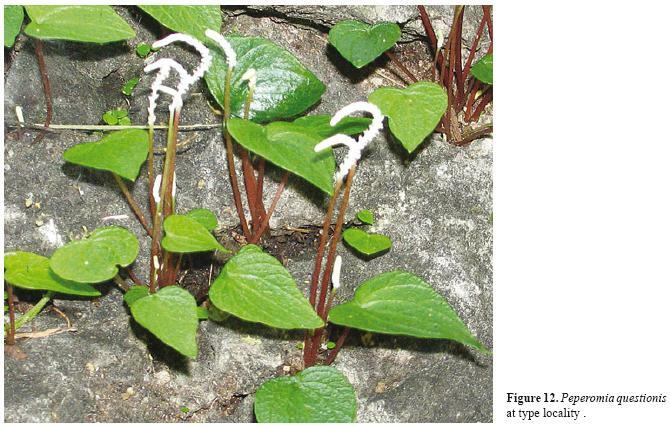 Peperomia basiradicans resembles P. gracillima A. W. Hill, another delicate Mexican geophyte. The tuber of the latter is rooting at the apex and lacks a basal smooth yellow part and an apical rough brown part. It also differs in its floral characters (floral bracts smaller, filaments about twice as long as in P. basiradicans, anthers smaller). 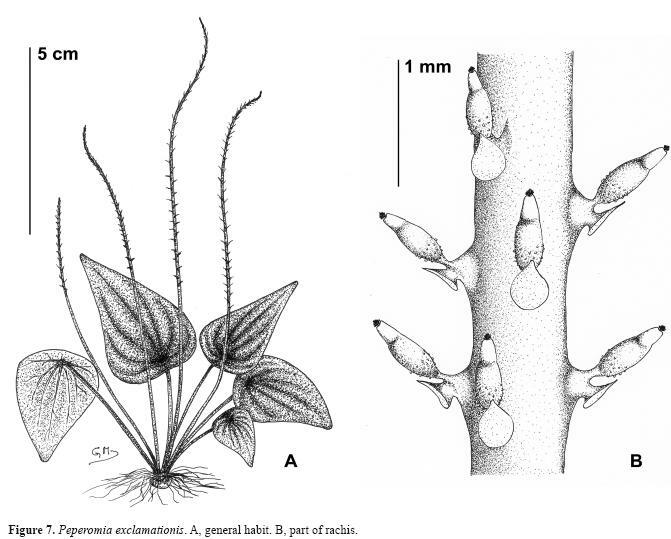 Peperomia basiradicans prefers higher elevations, whereas P. gracillima usually occurs between 1500-2500 m. The basal root position, common within the South American species, is quite rare in the Mexican and Central American species. Apart from P. basiradicans, it also occurs in P. cuchumatanica Véliz from Guatemala. Type: MEXICO. Guerrero: mun. Taxco, Tenango del Paraiso, Chacoalco spring in village center, bend of road to La Cascada, 18°33'46.4"N, 99°37'17.4"W, 1000 m, 15 Jul. 2007, M.-S. Samain et al. 2007-017 (holotype: BR! ; isotypes: GENT!, MEXU!). A speciebus geophilis notis distincta rhachidi crassissima fusiformique, interna spongiosa cavitate centrali; a Peperomia elatior G.Mathieu differt rachi longiore pedunculo brevioreque, stylo cylindrico, baccis sessilibus. Large herb, 10-25 cm tall in vegetative stage, entirely glabrous, all parts giving off a strong cilantro smell when crushed (Cilantro is the local name for Eryngium foetidum L. and/or Coriandrum sativum L., both commonly used in Latin American cooking and with a very distinctive smell). Tuber subglobose, to 1.3 cm diam and 1 cm tall, rooting at apex. Leaves 1-6(-10) per plant; petiole 5-13 long, sometimes reddish; lamina membranous, orbicular to ovate, to 12 cm diam., peltate a little below center, the apex usually distinctly acute, rarely rounded, 8(‑10)‑palmatinerved, with 3 nerves running into apical half of lamina, 2 nerves running almost laterally and 3(-5) nerves running into basal half, light green. Spadices 1-6(-9) per plant; peduncle 3-5 cm, sometimes reddish; rachis 5-12(-15) x 1.4 cm, long fusiform, sometimes about same length but usually 2-3 times as long as peduncle, pale green, filled with spongy tissue except for central cavity. Floral bracts orbicular to elliptic, ca. 0.9 mm long, peltate, the apex acuminate. Stamens with long filaments, initially 0.2-0.3 mm, then filiform, 0.7-1.0 mm, finely wilted but persistent; anthers 0.2-0.3 mm long. Ovary ellipsoid and smaller than its prominent, 0.7-0.8 mm long and slightly ellipsoid to cylindrical, hyaline glandular-dotted style; stigma terminal on small, slightly abaxially inclined stigmatal plateau. Fruits ellipsoid, ca. 0.9 mm long, sessile; pericarp granulose; style long-conical. Additional specimens examined. MEXICO. Guerrero: mun. Taxco, N of Taxco, N side of Chacoalco river, on cliffs, competing with Sedum frutescens, SE exposure, 1855 m, 25 Aug. 1955, R. Clausen s.n. (BH!, MEXU!, NY! ); 10 miles NE of Taxco, 1770 m, 10 Jul. 1940, C. Hitchcock & L. Stanford 7074 (US! ); above and E of Taxco on trail to Chacualco, 5800-6200 ft, 15 Aug. 1948, H.E. Moore & C.E. Wood 4607 (NY! ); road Taxco  Ixcateopan, 5 km SW of Taxco, Lanada, humid canyon, on rocks, 1790 m, 7 Jul. 1982, E. Martínez & J. Soto 1243 (MEXU! ); México: mun. Coatepec Harinas, near Villa Guerrero, along trail into Barranca de Texalotango from Rancho Santo Tobias, 21 Jul. 1945, C. Gilly et al. 14 (MICH! ); Villa Guerrero, Rancho Santo Tobias, small canyon reached by dirt road crossing corn fields, SE of the greenhouses of the ranch, 18°55'07.4"N, 99°37'38.6"W, 1960 m, 16 Jul. 2007, M.-S. Samain et al. 2007-026 (BR!, GENT!, MEXU!). Etymology. The specific epithet refers to the central cavity in the thickened rachis, a remarkable feature of this species. Distribution and habitat. Known from the Mexican states Guerrero and México in tropical deciduous forest (bosque tropical caducifolio sensu Rzedowski, 2006) between 1000-2000 m elevation. It usually occurs in small canyons or moderately shaded locations where it grows on rock walls, often in little substrate. 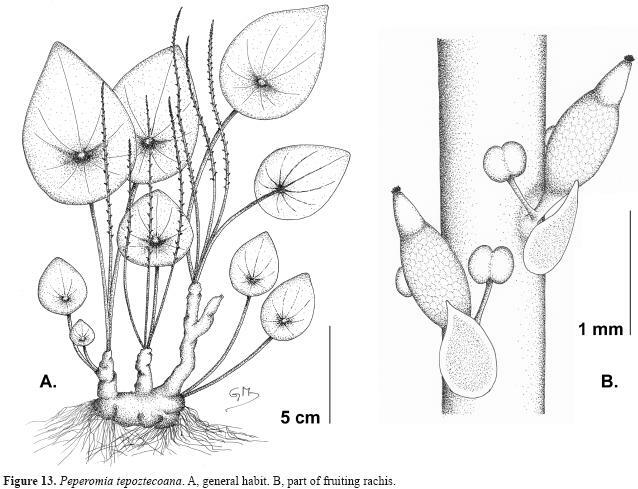 Peperomia cavispicata has to be distinguished from P.elatior G.Mathieu, which also has a thickened rachis. However, inflorescences of the latter species exhibit a long peduncle and a short rachis whereas in P. cavispicata it is exactly the opposite. The leaves of both species are similar although they are generally larger in P. cavispicata. The sessile fruit in P. cavispicata is easily distinguished from the pedicellate one in P. elatior. The pistil of P. cavispicata is distinct in the slender style whereas in P. elatior it is ellipsoid to obovoid and shows a particular large stigmatal plateau. Type: MEXICO. México: distr. Temascaltepec, mun. Luvianos, road El Estanco  Nanchititla between km 6 and 7 (just beyond the village El Salitre), small population on vertical rock wall, 18°52'33.4"N, 100°17'09.0"W, 1500 m, 17 Jul. 2007, M.-S.Samain et al. 2007-035 (holotype: BR! ; isotypes: GENT!, MEXU!). A speciebus geophilis notis distincta rhachidi crassissima fusiformique; a Peperomia cavispicata G.Mathieu differt rachidi breviore petiolo longioreque et baccis pedicellatis majoribus stigmatiferisque. Large herb, up to 15 cm tall in vegetative stage, entirely glabrous. Tuber globose or slightly flattened, to 1 cm diam, rooting at the apex. Leaves 1-5 per plant; petiole 6-14 cm long, sometimes reddish; lamina membranous, drying translucent, ovate to orbicular, (3-)4-8(-9) cm long and a little less wide, length/width ratio 1.1 to 1.2, the apex acute to broadly acuminate, the base rounded, peltate a little below the center, 8-palmatinerved, distinct abaxially, with 3 nerves running into apical half of lamina, 2 nerves running almost laterally and 3 nerves running into basal half, the main nerves branching distally. Spadices 1-7 per plant; peduncle slender, 14-21 cm, sometimes reddish; rachis fusiform, (2-)3-6(-10) x 0.8 cm, filled with spongy tissue, a central cavity absent, loosely flowered. Floral bracts elliptic to almost orbicular, 0.8-1.0 x 0.7-0.9 mm, peltate, the apex acuminate or sharply acuminate in young bracts at spadix apex, the margin entire. Stamens deciduous; filaments 0.5-0.7 mm long; young filaments and anthers purplish. Ovary ellipsoid and smaller than its prominent style; style ellipsoid to obovoid, 0.5-0.6 mm long, hyaline glandular-dotted, purplish when young; stigma terminal, flat, covering most of large, abaxially inclined, stigmatal plateau of 0.4-0.5(-0.6) mm diam. Fruits ellipsoid, 0.8-1.0 x 0.7-0.8 cm, pedicellate; pericarp granulose when young, slightly verruculose when maturing; style conical. Additional specimen examined. MEXICO. México: distr. Temascaltepec, mun. Luvianos, Oak woods, 8 Aug. 1933, G. Hinton 4494 (ILL!, K !, NY!, US!). Etymology. The specific epithet refers to the inflorescences with relatively short rachis but distinctly long peduncle. Distribution and habitat. Both known collections are from the Mexican municipality of Luvianos, where the species grows at the elevation of approximately 1500 m in oak forest on rock walls. The differences between this species and Peperomia cavispicata are given under that species. 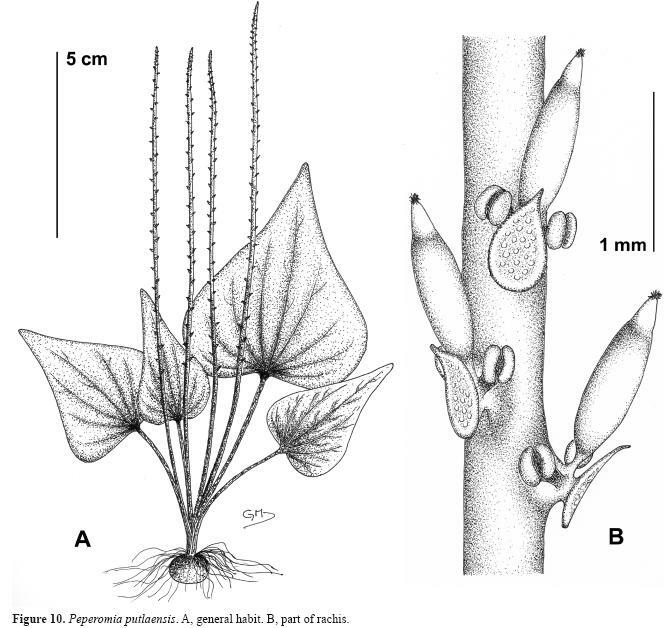 Peperomia elatior has a pistil morphology resembling that of P.ampla and P. cavispicata. The prominent style is obovoid in P.elatior, ovoid in P.cavispicata and cylindrical in P. ampla. Peperomia elatior is distinct in its flat stigma covering the terminal stigmatal plateau, the latter larger than in both other species. Peperomia elatior is also distinct in its pedicellate fruits. Note. Trelease already recognized Hinton 4494 as representing a new species. He annotated the ILL specimen with an epithet honoring Hinton as the type but never published the name. The name P. hintonii Yunck. was later published for a different species (Yuncker, 1965: 415). Yuncker apparently never saw the ILL specimen annotated by Trelease but did annotate the US duplicate: "This seems unique in its thick, fleshy spikes. Have been unable to match it and is possibly undescribed". Type: MEXICO. Michoacán: along road Coalcoman  Aquila, 18°41'20.1"N, 103°24'44.6"W, 1260 m, 25 Jul. 2007, M.-S. Samain et al. 2007-045 (holotype: BR! ; isotypes: GENT!, MEXU!, MO!). A Peperomia questionis G. Mathieu differt rachidi erecta longioreque, pedunculo breviore, lamina angustiore longioreque, apice longe acuminata, bacca ellipsoidea pedicellata, pericarpio non papillato vel basaliter minute papillato, bractea florali non glanduloso-punctata. Delicate herb, up to 5 cm tall in vegetative stage, entirely glabrous. Tuber globose, to 5 mm diam., yellow, smooth, rooting at the apex. Leaves 1-5 per plant; petiole 3-5 cm long; lamina membranous, drying translucent, deltoid, 2-6 x 1-4 cm, length/width ratio 1.5-2, the apex acute to acuminate, the base truncate to rounded, rarely subcordate, peltate 1-5 mm from base, 5-7-palmatinerved. Spadices 1-10 per plant; peduncle slender, 4-6 cm; rachis slender, erect, distal 1 cm sometimes bent, exceptionally split, (3-)4-8(-9) cm, longer than petiole except in small inflorescences, rather loosely white flowered. Floral bracts 0.4-0.5 mm diam., elliptic, peltate, the apex acute to acuminate. Stamens early deciduous; filaments 0.1-0.2 mm long; anthers ca. 0.2 mm long. Ovary ellipsoid; stigma terminal, cone-shaped on small stigmatal plateau. Fruits narrowly ellipsoid, 0.6 x 0.3 mm, together with floral bract on top of firm, broad conical and tapering pedicel; pericarp granulose or minutely papillate at base; style long conical to cylindrical. Etymology. The specific epithet refers to the erect rachis by which the species is easily distinguished from P.questionis G.Mathieu. Distribution and habitat. P. exclamationis is only known from its type collection, made in tropical deciduous forest in the state of Michoacán. It was found at an elevation of 1260 m in a shady environment, growing on vertical rock walls together with mosses and small ferns in a thin substrate layer. Peperomia exclamationis has to be distinguished from P.questionis G.Mathieu with which it shares peltate deltoid leaves. Although its distal end may be bent, the rachis of P. exclamationis is distinctly straighter, lacking the typical curl of almost the entire rachis that led to the choice of the epithet in P. questionis. This difference is obvious when comparing living plants of both species but might be less evident in herbarium specimens. The length/width ratio of the leaves of P. exclamationis is commonly 1.5-2 whereas in P. questionis it is about 1. Unlike P.questionis, the rachis is usually longer than the peduncle in P. exclamationis. In the latter species, the leaves are also long-acuminate whereas they are short-acuminate in P. questionis, resulting together with the different length/width ratio in a distinctly different leaf shape. 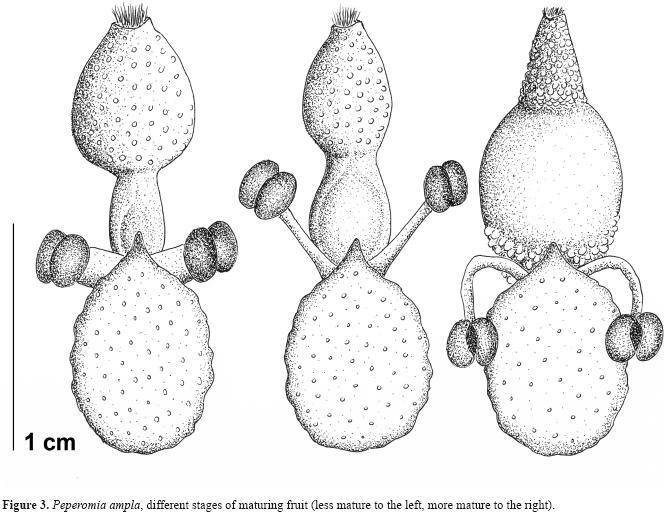 Additionally, both species also differ in their fruit morphology: ellipsoid, pedicellate, with the pericarp not papillate or minutely papillate at the base in P.exclamationis versus oblong, sessile, with the pericarp entirely and distinctly papillate in P.questionis. Type: MEXICO. Chiapas: mun. Oxchuc, 15 km N of Tenejapa, paraje Koltol'te, "Sumidero Yochib", 16°51'42.9"N, 92°27'13.9"W, 1320 m, 6 Aug. 2007, M.-S. Samain et al. 2007-088 (holotype: BR! isotypes: GENT!, K!, MEXU!, MO!, P!, US!). A Peperomia gracillima S. Watson differt lamina peltata subcentrali, inflorescentia filiformiore, bacca longe ellipsoidea, pedicellata, longe stylifera. Delicate herb up, to 2 cm tall in vegetative stage, entirely glabrous. Tuber globose, to 3 mm diam., the surface yellow, smooth, rooting at the apex. Leaves 1-10 per plant; petiole 1-4 cm long; lamina membranous, translucent, irregularly orbicular, 0.7-2.5 cm diam., the apex usually rounded, sometimes obtuse, peltate at ca. 1/3 of leaf length from base, with 7 main nerves faintly visible. Spadices 1-5 per plant; peduncle filiform, 3-5 cm long; rachis filiform, (2-)5-10(-12) cm x 0.5 mm, loosely flowered. Floral bracts elliptic, 0.5 x 0.3 mm, the apex acute, centrally peltate, hyaline glandular-dotted. Stamens with filiform filaments, 0.2-0.3 mm long; anthers minute, smaller than 0.1 mm. Ovary ellipsoid; stigma terminal, globose, fimbriate. Fruits long ellipsoid to cylindric; body 0.6-0.7 x 0.2-0.3 mm, pedicellate; pericarp granulose; style 0.4-0.5 mm long, papillate. Additional specimens examined. MEXICO. Oaxaca: mun. Valle Nacional, along highway 175 between Valle Nacional and Ixtlan, 17°36'07.6"N, 96°22'44.0"W, 1635 m, 9 Aug. 2007, M.-S. Samain et al. 2007-095 (BR!, GENT!, MEXU! ); loc. cit., 17°35'15.1"N, 96°29'21.8"W, 2265 m, 9 Aug. 2007, M.-S. Samain et al. 2007-098 (MEXU! ); Veracruz: mun. Uxpanapa, Ejido Álvaro Obregon, road La Chinantla  Nuevo Acapulco, ojo de agua 'El Resumidero', 17°19'N 94°24'W, 70 m, 7 Jan 2010, T. Krömer et al. 3873 (BR!, CITRO). Etymology. The specific epithet refers to the habitat where the type collection was made, hidden in the deep shade of a cave entrance. Distribution and habitat. Peperomia occulta is reported from the Mexican states of Chiapas and Oaxaca where it occurs in cloud forest (bosque mesófilo de montaña sensu Rzedowski, 2006) at an elevation between 1320-2265 m. Additionally, the species has also been collected in Veracruz where it occurs at a significantly lower elevation (70 m). At the type locality in Chiapas, plants grow on wet rock walls in a loamy substrate. At the same spot, but more exposed to daylight, occurs Peperomia turckheimii C.DC. The other collections were growing, together with mosses, on wet rocks close to a small waterfall in tropical rainforest. Although quite shady, their locations are more exposed to daylight than that of the type. Phenology. The plant has been found above-ground in August, flowering and fruiting. The thin, translucent leaves, short petioles and long threadlike inflorescences together with the shape of the fruits make P. occulta easily distinguishable from other small geophytic species. The extremely dark habitat where the type collection was made suggests that this environmental element may also be helpful in identifying the species. Peperomia gracillima is also a delicate geophyte with thin, translucent leaves bound to rather shady habitats. It is a rather rare species and its name is often misapplied to other geophytic Peperomia species. According to its type collection from Jalisco (Palmer 585 - BM!, F, G!, GH!, K!, MEXU!, MO!, NY!, P!, PH!, UC!, US!) it also has rather threadlike inflorescences, although less delicate than in P. occulta. However, P. gracillima has larger tubers (to 1 cm diam) and shows leaves that are centrally peltate and have a perimarginal nerve, distinctly visible on the translucent leaves. In P.gracillima the fruits are (sub)globose, sessile and have a short style. In P. occulta the fruits are narrowly ellipsoid, pedicellate and have a long style. The fruits of P.occulta resemble those of P. mexicana (Miq.) Miq. Type: COSTA RICA. San José: Cantón de Pérez Zeledón, P.N. Chirripó, trail from "Centro Ambientalista el Páramo" to "Sabana de Los Leones", 9°26'15"N, 83°30'36"W, 3100-3400 m, 18 Jul. 1998, E. Alfaro 1767 (holotype: INB! ; isotype: MO!). A Peperomia pedicellata Dahlst. differt inflorescentia 0.4-15 mm nec 20-40 mm longa, filamento minore 0.2 mm nec 0.4-0.8 mm longo, fructu globoso nec fusiformi. Delicate herb, entirely glabrous. Tuber globose, 5-10 mm diam, brownish and rugulose when dry, rooting at apex. Leaves 4-8 per plant; petiole 0.6-3.2 cm long, thin and fragile when dry; lamina orbicular to widely ovate (4-)13-30 mm diam., the apex rounded to obtuse, rarely short-apiculate, the base rounded, 7-palmatinerved, with main nerves diverging from base at angles of 95°- 45°, branched to sides, the secondary and tertiary nervation scarcely visible and opaque, evident only abaxially, the main nerve slightly raised abaxially, the lamina thick and almost fleshy and green when living, thick brownish and rigid when dry. Spadices 1-10 per plant, erect and white when living, rigid and brownish when dry; peduncle rigid when dry, 2.5-10 cm long, rachis short compared to the peduncle, 0.4-15 mm x 0.7-1 mm, rigid when dry, flowers sessile, loosely arranged on the rachis, widely spaced when in fruit. Floral bracts orbicular, the apex acuminate, folded on the sides when dry, appearing almost elliptic, prominent (as compared to the flowers), 0.6-1.0 mm diam., thick at the center, marginally membranous. Stamens with short filaments, 0.2 mm long; anthers prominent, 0.1-0.2 mm long. Ovary ovate, slightly distant from the rachis; stigma sessile, terminal. Fruit globose to ovate, 0.8 x 0.4-0.5 mm, short-apiculate at the apex; basally fixed and slightly distant and free from the rachis; pericarp slightly verruculose. Etymology. The specific epithet refers to the habitat of this species: open grasslands of paramo-like vegetation. Distribution and habitat. Apparently restricted to open grasslands in a paramo region of Valle de los Leones, a locality in the National Park of Chirripó, at 3100-3400 m, on the Central Cordillera. We suspect the species is more common than reported. Likely the small size of the plants makes it difficult to locate this distinctive species. Phenology. The plant was found above-ground in July, flowering and fruiting. Peperomia paramuna is easily distinguished from P. gracillima, erroneously reported for Costa Rica (Burger, 1971: 38), by its different habitat preference. Peperomia paramuna occurs in open grasslands whereas P. gracillima is found in deep shady canyons and at cave entrances. Furthermore P. gracillima has thin leaves that often dry almost translucent in contrast to the thick leaves in dry material of P. paramuna. The species exhibits some similarity with P. pedicellata Dahlst., but is easily distinguished by its globose to ovoid fruits and the much shorter filaments, 0.2 mm instead of 0.9 mm. Peperomia gracillima is probably restricted to Mexico whereas P. pedicellata occurs in southern Mexico, Guatemala, Honduras and El Salvador. Type: MEXICO. Oaxaca: mun. Putla, 52 km SW of Tlaxiaco along the road Tlaxiaco  Pinotepa Nacional, Barranca de la Cama, 17°11'57.6"N, 97°53'17.2"W, 2015 m, 10 Aug. 2007, M.-S. Samain et al. 2007-104 (holotype: BR! ; isotypes: GENT!, K!, MEXU!, MO!, US!). A Peperomia mexicana (Miq.) Miq. differt lamina deltoidea non peltata et bacca breviter stylifera. Delicate herb, up to 10 cm tall in vegetative stage, stemless, entirely glabrous. Tuber globose, to 1 cm diam, brown, rooting at apex. Leaves 1-8(-10) per plant; petiole 2-10 cm, usually red spotted; lamina membranous, deltoid, to 5 x 4 cm, length/width ratio 1.1-1.6, the apex acuminate, acute to rounded at the tip, the base truncate or subcordate, rarely distinctly cordate, 5-7-nerved, the outermost nerves branching near their base, entirely green or red along nerves abaxially. Spadices 1-9 per plant; peduncle usually slightly red-spotted, to 4 cm long; rachis to 10 cm long, slender, erect, loosely flowered. Floral bracts elliptic, 0.6 x 0.4 mm, the apex acuminate, caudate in young bracts, centrally peltate, glandular-dotted. Stamens with short filaments; anthers 0.2-0.3 mm long. Ovary long-ellipsoid; style conical, 0.1-0.2 mm long; stigma terminal. Fruits oblong, 1.0 x 0.35 mm, short-pedicellate 0.1-0.2 mm; pericarp granulose, greenish beige to light brown. Additional specimens examined. MEXICO. Oaxaca, Barranca del Pájaro, 9 Jun. 1985, A. García Mendoza & R. Torres 1487 (MEXU [#458712, #458708]! ); mun. Putla, 65 km SW of Tlaxiaco along the road Tlaxiaco  Pinotepa Nacional, Barranca del Pájaro, 17°07'51.1"N, 97°52'20.2"W, 1315 m, 10 Aug. 2007, M.-S. Samain et al. 2007-105 (BR!, GENT!, MEXU!, MICH!, P! ); 52 km SW of Tlaxiaco on the road Guerrero  Putla, 2050 m, 18 Sep. 1993, S. Zamudio & E. Pérez 9228 (BR!, IEB!, K!). Etymology. The specific epithet refers to the town of Putla in southwestern Oaxaca. So far, the species has only been collected in this area. Distribution and habitat. All known collections are from a restricted area with oak forest between Santa María Tlaxiaco and Putla in the Mexican state of Oaxaca. The species occurs at 1300-2050 m, where it grows on wet rock walls in little substrate. Phenology. The species is above-ground at least from June to September. 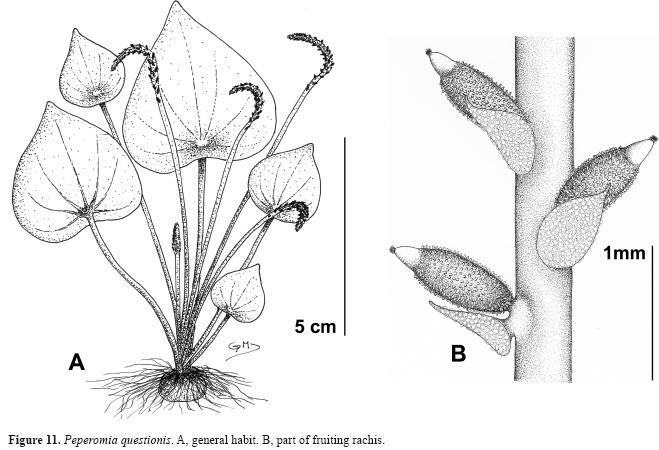 By its non-peltate leaves, P. putlaensis can easily be distinguished from other geophytic Peperomia species with deltoid leaves like P. exclamationis G.Mathieu and P. questionis G.Mathieu. The leaves of P. claytonioides Kunth and P. pedicellata Dahlst., the latter often identified with its synonym P. peltata C.DC. (Mathieu and Callejas, 2006: 342), are usually more obovate than deltoid and also these species show peltate leaves. The subpeltate leaves of P.mexicana (Miq.) Miq., are usually distinctly longer (length/width ratio 2). Additionally, the fruits of the latter species are characterized by their long style. Type: MEXICO. Guerrero: along road Chilpancingo  Tepecichotlan, 17°29'00.2"N, 99°25'45.2"W, 1060 m, 13 Jul. 2007, M.-S. Samain et al. 2007-014 (holotype: BR! ; isotypes: GENT!, MEXU!). A Peperomia exclamationis G.Mathieu differt rachidi curvata brevioreque, pedunculo longiore, lamina latiore brevioreque, apice breviter acuminata, bacca oblonga sessili, pericarpio omnino papillato, bractea florali glanduloso-punctata. Delicate herb, up to 10 cm tall in vegetative stage, entirely glabrous. Tuber globose, to 1 cm diam., yellow, smooth, rooting at apex. Leaves 1‑7(‑9) per plant; petiole red, 2-10 cm long; lamina membranous, deltoid, 1.5-4.5 x 1.3-4.2 cm, dark green adaxially, whitish green abaxially, sometimes minutely but densely dark glandular-dotted combined with less dense whitish vesicles adaxially, the apex acute or acuminate, the base usually truncate or subcordate and peltate 1-5 mm from base, rarely deeply cordate and non-peltate, 5-7-palmatinerved, reticulately nerved in between, minutely papillate at main nerves adaxially, slightly depressed adaxially between main nerves. Spadices 1-7(-9) per plant; peduncle slender, 4-8 cm long, red; rachis 2-3 cm, erect only in juvenile stage when less than 1 cm, curled when maturing, white and loosely flowered. Floral bracts elliptic, 0.8 x 0.5 mm, centrally peltate, the apex long acuminate, white, dotted with large glands. Stamens with short filaments, 0.2-0.3(-0.4) mm long, deciduous when fruits are mature; anthers 0.2-0.3 mm. Ovary long-ellipsoid; surface papillate; style granulose; stigma terminal, globose, fimbriate; pistil white. Fruits oblong, the body 0.8-0.9 x 0.4 mm, sessile, the pericarp entirely long-papillate, though not always equally dense, young fruit white, mature fruit light brown; style conical, 0.2-0.3 mm long, shriveling and, in the mature fruit, somewhat abaxially inclined. Additional specimens examined. MEXICO. Guerrero: Petaquillas (5 km SE of Chilpancingo), road Petaquillas  Colotlipa, 4 km E of Petaquillas (by deviation), 20 Jul. 1977, Germán et al. 520 (MEXU! ); mun. Chilpancingo, Rincón de la Vía, 17°17'15"N, 99°28'55"W, 14 Jul. 1968, Kruse 1858 (MEXU! ); highway to Acapulco km 338, 3 km beyond Acahuizotla, 3000 ft [915 m], 23 Aug. 1948, H. Moore & C. Wood 4723 (BH!, GH!, MICH!, NY!). Other record. MEXICO. Guerrero: mun. Chilpancingo, Hwy Chilpancingo-Acapulco, between km 38 and 39, 17°19'08"N, 99°28'10.3"W, 13 Jul. 2007, M.-S. Samain et al. 2007-s.n. (photographs of plant in situ, GENT!). Etymology. The specific epithet refers to the marked curl of the rachis, which makes the inflorescences resemble question marks and which seems to be a consistent feature of this species in the wild. However, under greenhouse conditions, the rachis tends to become longer and decumbent. In that case, the characteristic curl may be less obvious or even absent. Distribution and habitat. The species is reported from tropical deciduous forest in the state of Guerrero, growing in small soil pockets on shaded rocks and rock walls, elevation around 1000 m.
Phenology. The species has been found above-ground in July and August. The differences between this species and Peperomia exclamationis are given under that species. Peperomia questionis differs from P. putlaensis G.Mathieu, which has non-peltate leaves and has peduncles shorter than the rachis. In P. questionis the fruits are sessile whereas they have a long pedicel and a short style in P. pedicellata Dahlst. In P. questionis the length/width ratio of the leaves is commonly about 1 whereas it is 1.5-2 in P. exclamationis. A Peperomia chutanka Pino differt lamina ovata, utrinque viridi, petiolo basi latiore, pericarpio reticulato, praeferit locos humidos umbrososque. Robust herb, up to 25 cm tall in vegetative stage, entirely glabrous. Tuber to 7 cm long and 3 cm diam., irregular, brown, rooting at base, with several contorted trunk-like outgrowths at tuber apex, sometimes branching, grey-brown, to 18 cm long and 1 cm diam., with distinct distal petiole scars, the leaves and inflorescences at apex or body of trunks, less commonly at growing points at apical side of tuber. Leaves 1-10 per plant; petiole 5-10 cm x 2-4 mm, usually basally widest; lamina chartaceous, ovate, rarely almost orbicular, to 10 x 7 cm, length/width ratio (1-)1.3-1.4, peltate at 1/4 to 1/3 of leaf length from base, the apex obtuse to acute or slightly acuminate, the base rounded, 10-palmatinerved, glossy green adaxially, slightly whitish green abaxially. Spadices 1-10 per plant; peduncle (1-)4-7 cm; rachis (5‑)7-12 cm, moderate-densely flowered. Floral bracts orbicular to elliptic, 0.8-1.0 mm long, peltate, the apex acute to acuminate, glandular-dotted. Stamens with filaments 0.4-0.7 mm long; anthers ca. 0.4 mm long. Ovary long ellipsoid, narrower than style; stigma terminal. Fruits long-ellipsoid, 0.7-0.9 x 0.5-0.6 mm, shortly pedicellate; pericarp reticulate; style long- conical, almost half as long as the fruit body. Additional specimens examined. MEXICO. Morelos: near Cuernavaca, 7000 ft, 2 Jun. 1898, C. Pringle 7630 (GH!, VT [mounted together with C. Pringle 5182, which is P. lanceolatopeltata C.DC.]! ); mun. Tepoztlán, 'El Tepozteco', 18°59'10.7"N, 99°06'07.7"W, 1950 m, 19 Aug. 2007, M.-S. Samain et al. 2007-121 (BR!, GENT!, MEXU!). Etymology. The specific epithet refers to "El Tepozteco", the pyramid above the town of Tepoztlán. All known collections are from a narrow canyon just below the pyramid. Apart from the type, the species is known from another Pringle collection. The label of Pringle 7630 at VT (where Pringle's first sets are housed) mentions 'parque', by which the archeological park with the Tepozteco pyramid is meant. Pringle 9047, the type, collected 2 years later, is likely made at the same location. The steep path to the pyramid was, certainly in those days, probably the only access to the heights of the Sierra de Tepoztlán where P. tepoztecoana is growing. Distribution and habitat. All known collections are from 1 locality. The species grows on shaded vertical rock walls. Phenology. The plant produces leaves at least between May and August. In August it is no longer flowering or fruiting. The trunk-like outgrowths on top of the tuber are the most typical feature of this species. They resemble similar structures in Peperomia chutanka Pino from Peru, but in that species they tend to be more numerous and more branched. The leaves of P.chutanka are usually also a little smaller and rather orbicular to elliptic than ovate, and especially differ in the violet abaxial side. The petiole in P. tepoztecoana is widest at the base whereas it is widest at the apex in P. chutanka. The reticulate fruit pericarp of P.tepoztecoana is not reported in P. chutanka. The latter species prefers exposed, dry rock walls where it occurs often together with lichens. Peperomia tepoztecoana prefers the shady and rather moist rock walls of deep canyons. Type: BELIZE. Toledo: Columbia River Forest Reserve, Union Camp, ca. 3 km W of SW end of Little Quartz Ridge, creek bed with exposed limestone rock in area with semideciduous forest 35-30 m tall, 16°23'53"N, 89°07'34"W, 700-750 m, 22 Feb. 1997, B. Holst 5959 (holotype: HUA! ; isotypes: MO!, SEL!). A Peperomia claytonioides Kunth differt foliis nigro-puncticulatis, inflorescentia 0.3 mm nec 0.5 mm diameter. Delicate, lithophytic herb, entirely glabrous. Tuber ellipsoid, 5 mm long, 3 mm diam., rooting at the apex, without apparent foliar scars. Leaves 4-7 per plant; petiole 2.5-3.8(-5.1) cm long, slightly striate; lamina ovate to widely ovate or elliptic-ovate, peltate 2-5 mm from the margin, 1.2-2.4(-2.9) x 1.5-1.8 (-2.3) cm, the apex rounded, obtuse or short acute with obtuse tip, the base rounded to truncate or slightly cordate, 5-6-palmatinerved, the innermost nerves diverging in angles of 45°, outer nerves diverging in angles of 80°, the tertiary nervation evident abaxially, forming prominent areoles, these loops connected towards margin forming a prominent marginal nerve that extends at least 2/3 of leaf, dense but minutely pellucid-dotted, the idioblasts dark brownish to blackish in dry leaves, abundant and visible in both faces, green, membranous when living and dry. 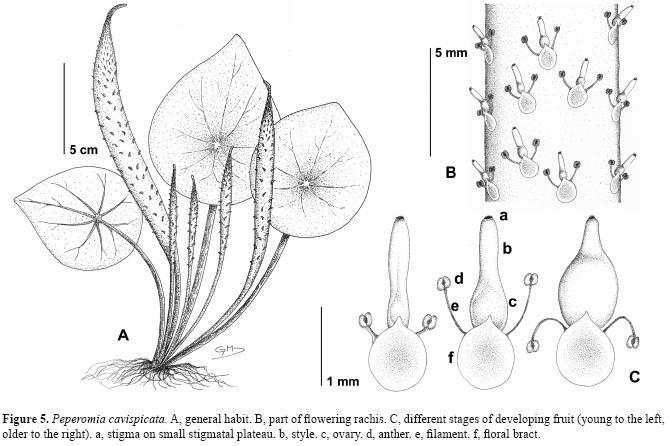 Inflorescences compound, the common axis of 5.5-12 cm bearing 2-6 spadices, 1 terminal, the others slightly lateral, sub-erect, white when living and dry, each individual spadix from axil of a small deltoid bract, 0.8 mm diam, membranous and persistent, the spadices slightly spaced by short internodes, 0.3-0.7 mm long; peduncle of each individual spadix 2-4 mm long; rachis 2-5 (-9) cm x 0.3 mm, filiform, white in dry material, the flowers densely congested on rachis at anthesis, widely spaced in fruit (0.7-1.2 mm). Floral bracts widely obovate, prominent, 0.6-1.1 mm diam, the base adnate and decurrent along the rachis, the lamina free from the rachis, expanded and wider, white and almost translucent. Stamens with filaments 0.4 mm long; anthers 0.3 mm long. Ovary oblong, 0.7 x 0.01 mm, sessile; stigma apical. Fruit globose, 0.4 mm diam., sessile and basally attached to rachis, pale brownish, apically long stylose, the stylar portion 0.3 mm long, and obliquely oriented to the body of the fruit. Additional specimens examined. BELIZE. Toledo: Columbia Forest Reserve, Camp 2, 6-8 km SE of Union Camp, trail from camp 2 to camp 3, moist tropical mixed hardwood forest with palm and shrub understory, soils derived from limestone, 16°23'14"N, 89°4'37"W, 665-700 m, 15 Feb 1997, T.Hawkins 1424 (HUA!, MO!, SEL); Southwestern Maya Mountains, Columbia River Forest Reserve, Union Camp, ca 3 km W of SW end of Little Quartz Ridge, semi-evergreen forest on undulating limestone hills, areas harvested for mahogany and chicle in the past, otherwise undisturbed, on mossy rocks, 16°23'N, 89°09'W, 700-750 m, 4 Apr. 1992, B. Holst 3882 (HUA!, MO!, NY, SEL). Etymology. The specific epithet is derived from the type locality in the department of Toledo, Belize. Distribution and habitat. 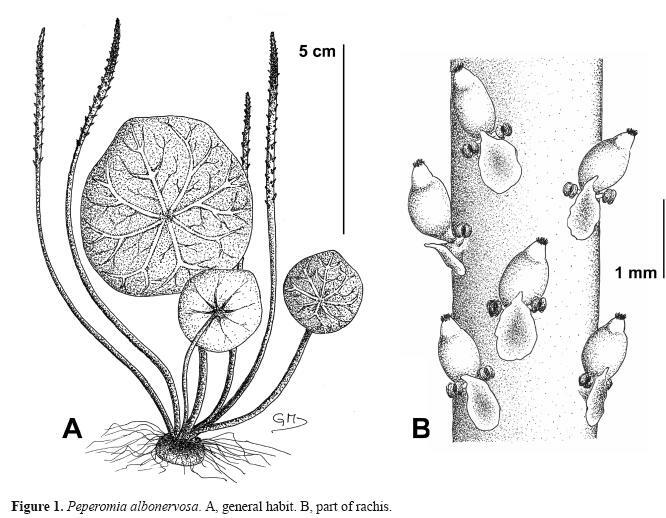 The species grows on limestone blocks of small streams and apparently is locally abundant in forests dominated by Terminalia amazonia and Manilkara zapota. Phenology. The species has been found above-ground in July. At first sight Peperomia toledoana looks similar to P. claytonioides Kunth. 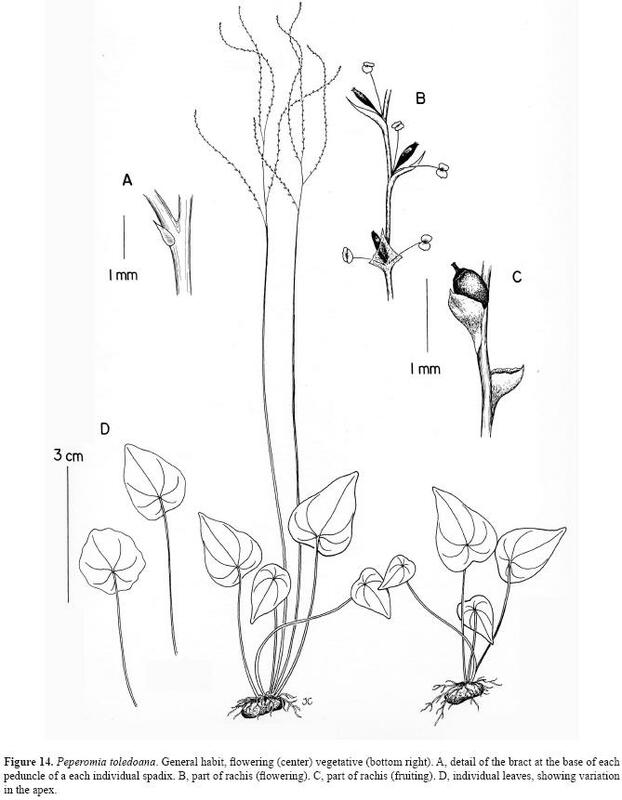 However, P.toledoana is a more fragile plant, with much thinner inflorescences; its leaves are 1.2-2.4(-2.9) x 1.5-1.8(-2.3) cm and the fruiting rachis 2-2.4(-2.9) x 0.3 mm whereas in P. claytonioides leaves are (2.7-)3.5-8.7(-12.5) x (1.1-)1.7-4 cm and the fruiting rachis (3-)5-8 x 0.5 cm. The leaves in P.toledoana are black pellucid-dotted, whereas this is lacking in P. claytonioides. Type: COSTA RICA. San José: canton Acosta, distr. Cangrejal, Hacienda Tiquires, Quebrada Ayarales, pluvial montane forest, 800-1100 m., 9 Jul. 2003, R. Callejas & F. Morales 13253 (holotype: INB! ; isotype: HUA!). A Peperomia linaresii Véliz differt foliis peltatis, erectis, nigro-puncticulatis, inflorescenctia erecta, fructu pedicellato, breviter styloso 0.3 mm nec 0.9 mm. Minute epilithic, shade loving herb, entirely glabrous. Tuber globose-ovoid, greenish brown when living, 0.8-2.5 mm diam, with rather few elongated roots at apex of tuber. Leaves solitary; petioles erect, 0.7-1.5 cm long, not pellucid-dotted, green when living, brownish and thin when dry; lamina ovate to elliptic-ovate, peltate about 1-2 mm from the base 1.8-2.5(-3) x 1.3-2 cm, the apex slightly acute, the base rounded to truncate, 5-7-palmatinerved, the main nerves diverging from the base at angles 40°-85°, the nerves branched at the apex and loop-connected, the main nerve with a pair of secondary nerves diverging in the upper third portion, the tertiary nervation forming a dense areolate pattern, the nerves impressed in both faces, only the main nerve slightly elevated abaxially, the lamina green-metallic and membranous when living, thin, almost translucent and pale green when dry, the margin eciliate, densely and minutely pellucid-dotted, the idioblasts blackish, abundant and visible adaxially, opaque abaxially. Spadix solitary, apparently not axillary to the leaf but lateral, erect to slightly curved at the apex, white at anthesis, greenish at fruit; peduncle 2.5-4 cm x 0.2 mm, filiform, pale green when living; rachis 1-1.5 cm x 0.1 mm at anthesis, 2-3.5 cm x 0.1 mm in fruit, striate and whitish, almost translucent when dry. Floral bract orbicular to ovate when dry, 0.2-0.3 mm, subsessile and appearing free from the rachis when dry, the flowers congested at anthesis, widely spaced in fruit. Stamens with long filaments, 0.7-0.9 mm long; anthers minute, 0.1 mm. Ovary subsessile and free from the rachis, ovoid to ellipsoid and short-stylose; stigma terminal. Fruit ellipsoid, the fruit body 0.6-0.7 mm long, 0.2-0.3 mm pedicellate, the pedicel rigid, the pericarp pale green to brownish, long-stylose, the stylar portion 0.3 mm long. Etymology. The epithet refers to the single solitary leaf of each individual plant. Distribution and habitat. The type collection was found growing on exposed and moss covered walls of clay-granitic soils along a road in a pluvial montane forest region. Due to the size of the plants and the fact that each one has a single leaf, collecting of the species was rather accidental and it took some time before we were able to recognize the species among the dense and wet mats of mosses, hepatics and small ferns. Phenology. The plant has been found above-ground in July. Peperomia linaresii Véliz, recently described from Guatemala and El Salvador (Véliz, 2007: 10), also has 1(-2) leaves per plant and a solitary inflorescence. 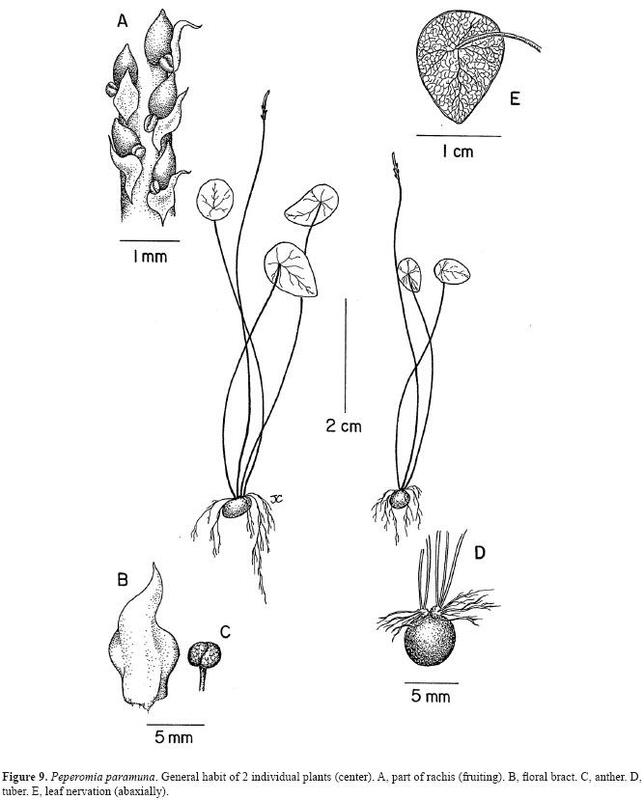 Both species can be distinguished by the pedicellate fruits with short style of Peperomia unifoliata in contrast to the sessile and long-stylose fruits of P. linaresii. Furthermore the leaves in P. linaresii are lanceolate to ovate and without any glands whereas those in P. unifoliata are elliptic-ovate and densely black pellucid-dotted. 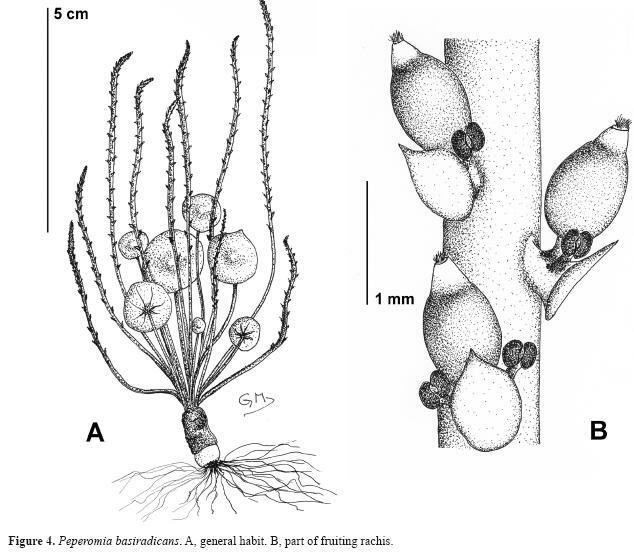 The fusiform and pedicellate fruits of P. unifoliata are similar to those of Peperomia pedicellata Dahlst., but in P. unifoliata the pedicel is distinctly shorter (0.3 mm) than in P. pedicellata (0.4-0.6 mm) and the fruits are smaller (0.6-0.7 mm, not 0.8-1.2 mm long). Tildenia was originally described by Miquel (1843a) as a genus  then consisting of 1 species, Tildenia mexicana (= Peperomia mexicana) nom. cons. prop. (Mathieu, 2009: 1374)  within the family Piperaceae. Shortly afterwards, Miquel (1843b) also transferred Peperomia umbilicata Ruiz et Pav. to the new genus but named it Tildenia peruviana Miq. In his Systema Piperacearum, he recognized Tildenia as a subgenus ['sectio'] of genus Peperomia within the tribe Peperomieae (Miquel, 1843c-1844). Dahlstedt (1900) recognized a much wider circumscribed subgenus Tildenia and merged all Peperomia species with peltate leaves without noting the occurrence of tubers (Samain et al., 2007). Hill (1907) finally recognized the tuberous geophytic species within the subsection Geophila of the subgenus Tildenia sensu Dahlstedt (Samain et al., 2007). 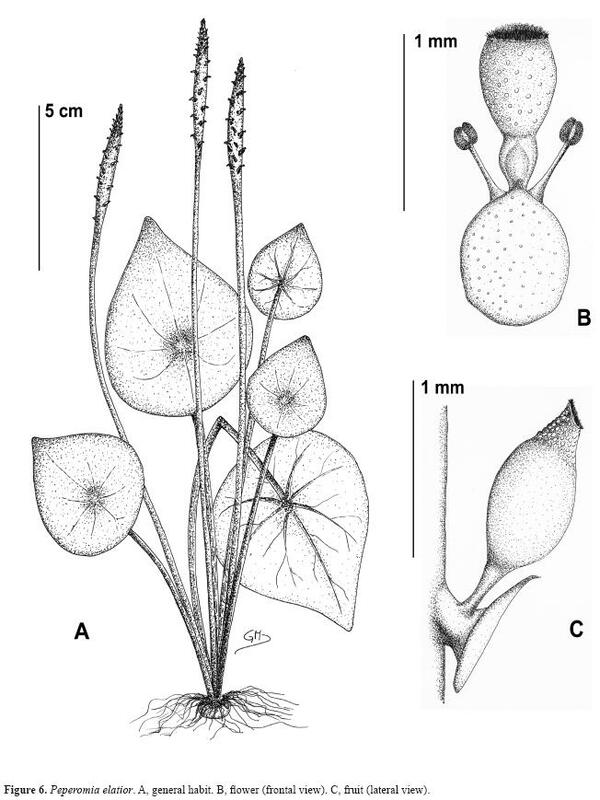 However, recent phylogenetic analyses of the genus Peperomia based on coding and noncoding plastid DNA show that subsection Geophila is clearly separated from the remaining species of Tildenia sensu Dahlstedt (1900), forming a distinct monophyletic clade (Wanke et al., 2006, 2007; Samain et al., 2009). The correct name to be used for this clade is Peperomia subgenus Tildenia (Miq.) Miq. Hill (1907) distinguished 22 different geophytic species from Mexico and adjacent countries as well as from South America, of which 17 are still accepted today. Peperomia cotyledon needs to be excluded from this group based on molecular data (Wanke et al., 2006; Samain et al., 2009), which confirmed earlier morphological evidence (Dahlstedt, 1900). Since Hill's revision (1907), more than 15 species belonging to this group were described (Trelease, 1922, 1936; Rauh and Kimnach ,1987; Pino, 2004, 2008; Pino et al., 2005; Véliz, 2007). Several species of Trelease (1922) from Mexico and Costa Rica were published with scanty descriptions based on herbarium specimens and have appropriately been synonymized with more widespread species (Burger, 1971; Nyffeler and Rowley, 2002). Similar to the species described in this paper, the more recently described species were all based on fresh field collections, generally by the author himself, and clearly are segregate species. This is not only supported by distinct morphological characters but also by our ongoing molecular investigations (unpublished), which in addition confirm the relatively narrow species concept applied throughout Peperomia. Finally, it is also worth noting that most of the newly described species are narrow endemics (Fig. 16), which might be explained as 1) a result of undercollection due to the inconspicuousness of the plants or difficult accessibility and seclusion of some of their localities, or 2) a genuinely restricted distribution pattern, perhaps related to the scarcity of suitable habitats. Further field study is required to elucidate this interesting pattern which is not only applicable in Peperomia subgenus Tildenia but in many terrestrial Peperomia species. We thank the Secretaría de Medio Ambiente y Recursos Naturales (SEMARNAT; permit numbers SGPA/DGGFS/712/1397/07, SGPA/DGGFS/712/2486/09 and SGPA/DGGFS/712/0424/10) for permission to collect material; the staff of the Herbario Nacional and the Instituto de Bíología of the Universidad Nacional Autónoma de México for support with field and herbarium work; Hilda Arreola, Álvaro Campos, Rosamond Coates, Emmanuelle De Foy, Daniel De León, Hilda Flores, Abel García, Socorro González, Carolina Granados, Thorsten Krömer, Esteban Martínez, Marco Martínez, Juan Mendoza, Helga Ochotorena, Yocupitzia Ramírez, Alberto Reyes, Jerzy Rzedowski, Alfredo Ruíz, Gerardo Salazar, Victoria Sosa, Victor Steinmann and Sergio Zamudio for assistance with field work and logistics; Gerrit Davidse, Kanchi Gandhi and John Wiersema for their input on nomenclatural matters; Guillermo Pino, Michael Nee and Craig Swafford for constructive comments on the manuscript; the Botanical Gardens of Ghent University and Dresden Technical University for general support; and the curators of the herbaria at AAU, B, BH, BIGU, BM, BOLV, BR, C, CIB, CIIDIR, CM, CORU, CPUN, E, EBT, F, G, GB, GENT, GH, GOET, HEID, HUA, HUT, IBUG, IEB, ILL, INB, ISC, JE, K, L, LPB, LY, M, MA, MEXU, MICH, MO, NY, P, PH, PR, PRC, QCNE, S, SEL, TCD, U, UC, UPS, US, USM, VT, W, XAL and ZSS for the loan and permission to study material. This work was supported by the Research Foundation Flanders (FWO-Vlaanderen; FWO G.0172.07; FWO travel grants to the first and last author; the German Science Foundation (DFG; NE681/5-1, DFG; NE681/5-2); the Department of Biology, Ghent University; the Friends of the Botanical Garden Ghent; the Gesellschaft der Freunde und Förderer der TU Dresden, and the German Academic Exchange Service (DAAD PPP Colombia).